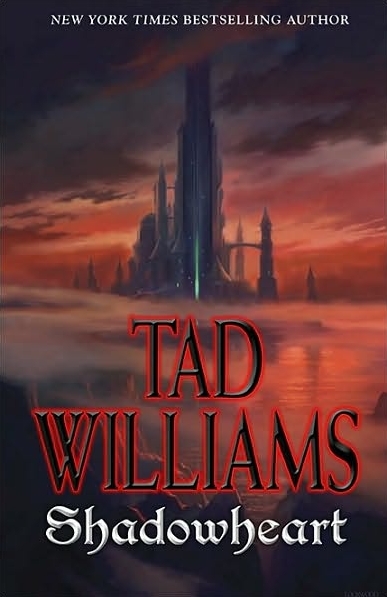 To really understand Tad Williams’ Shadowmarch series, and my ultimate appreciation of it, one must look back to the rocky road of the original conceptualization and execution of its first novel, also titled Shadowmarch. First conceived as a television show described by Williams as “Hill Street Blues meets Babylon 5 meets Lord of the Rings,” then as a free online serialization, Shadowmarch went through many forms in its infancy. Readers were finally introduced to the story when Williams released Shadowmarch on his website as a free-flowing piece-by-piece novel — an avenue that’s not unusual for aspiring writers hoping to catch the eye of a publisher, but an odd move for an author as well established as Williams. Eventually, due to a lack of readers willing to pony up the cash necessary to read beyond the first five chapters, the project changed course again and was converted into a full-fledged, traditionally published series. At this time, Shadowmarch was heavily re-written, added-to and even saw a shift from present tense to a more traditional third-person past-tense narrative. Unfortunately, and despite the heavy revisions, these serialized roots left their mark all over the early volumes of the series. Though enjoyable (and the novel that finally convinced me of Williams as a novelist, after several failed attempts to read his classic Memory, Sorrow and Thorn trilogy), Shadowmarch felt much like a novel looking for a plot. Things happened, characters were introduced, a world was built, but it never quite felt like Williams knew where the road led or had an ultimate plan in mind for the series. The potential was there, the bones were there, but the series was searching for a proper heart and soul. As Shadowheart proves, though, that heart and soul can be found if the author digs deep enough into the characters that tell the story. As those characters, from enigmatic Barrick to kind-heart Chert Blue Quartz, from innocent Qinnitan to the cold-hearted Yassamez, evolve and change, Williams takes their most intriguing aspects and struggles and develops rounded, interesting people out of the cardboard cut-outs he began with. It’s a pleasing process for readers. But it was not simply the large experiences that had changed her, she realized, it was all the things she had seen in the last year, all the ordinary and extraordinary people she had met, players and thieves and traitors, goblins and Kallikans, as well as the situations she had been forced to endure—hunger, fear, having no roof over her head, and no friends and no money. Briony felt as though the only thing she had in common with her younger self was the name and the place they were born. In many ways, Briony’s thoughts on her self-discovery exactly match my feelings towards the series and its evolutions through its four volumes. 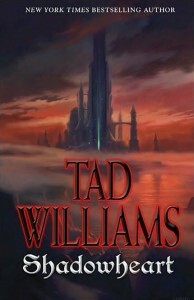 While the series wanders through its early and middle sections, Williams, with all the skill of a confident and experienced storyteller, recovers well with the concluding volumes of the series and Shadowheart in particular manages to wrangle those meanderings together to give some meaning to them. I’m not convinced that Williams could see the whole picture when he began conceptualizing Shadowmarch, but he left himself a partially completed puzzle with many loose pieces to work with. The way he finally assembled that puzzle in Shadowheart helped me retroactively appreciate some of Briony and Barrick’s misadventures in Shadowplay; an admirable feat. The final two volumes see the series bloom from an awkward, lost teenager to a confident young adult, full of a renewed sense of self and purpose. The major driving force behind this shift, both in the characters and the renewed focus of the novels, are the mystical Qar. Used as a source of conflict in the first two volumes, this Fey race was hard to appreciate. They were too similar to George R.R. Martin’s Others or Williams’ own Sithi and seemed too single-minded in their attempted conquest of the human castle Southmarch. In Shadowrise and Shadowheart, however, Williams finally pulls back the curtain on the Faeries; suddenly (and naturally), they become a sympathetic and heartbreaking addition to the story. It is through the Qar and their plight that the entire series finds its footing and finally begins to tell the story it was searching for in the first place. The series begins life with the almost cartoonish, episodic feel of Shadowmarch, meanders greatly through Shadowplay and slowly evolves through the final two volumes into a thoughtful, poignant exploration of myth and responsibility. These heavy themes are most effectively explored in the parallel tales of how the two twins, without realizing it, reach adulthood to find themselves as drastically different people. Ultimately, both Barrick and Briony reach their true potential by embracing the confidence necessary to throw off the shackles of youth and embrace the responsibility of their regency as three armies converge on their homeland. Williams keenly explores the ways we must sacrifice and compromise as we grow to adulthood. Barrick never loses his anger or his inept sociability, and Briony never loses her dependance on others, but separately they learn to accept these faults and instead use them as strengths. They reach end the novel still flawed, but recognizably stronger versions of the youths we first met in Shadowmarch. Nobody is more ardently aware of the changes than Briony and Barrick themselves. The final 100 pages of Shadowheart are a bitter-sweet denouement that show the Eddon twins dealing with the utterly alien world they find themselves grown into. In typical Williams fashion, the reader isn’t left feeling totally safe by the end of the novel. Unlike much Epic Fantasy, though ‘good’ might triumph over ‘evil’, there is little to indicate that any battle has been won with any sort of finality. Changes have occurred, but new problems always arise and, as with real life, there is no ‘end’ to the story, just a natural stopping point for the narrator. The reader is left to yearn for the stories yet to be told. Beyond the exploration of the characters, Shadowheart (and the entire series) is a story that challenges the ideas of myth and religion. How much is true? How much is convenience? How much is misinterpretation? Or convenient misinterpretation? Much like the Abrahamic religions of our world, the three major factions in the novel (Qar, Xixian and Marchlander) all have religious beliefs that centre around the same basic tenets, gods and origin stories, but with their own tellings and beliefs on how the pieces fit together. Many of the mysteries revolve around these misconstrued concepts and differences, but it is in the hidden space between all of these beliefs that the true answers to the series’ mysteries are often found. Williams weaves the separate strings of half-told stories together with skill, and the revelations are satisfying and genuinely surprising. It’s a provocative, if someone surface-level, exploration of the power of storytelling, myth and religion. Shadowheart is, essentially, one enormous climax. The pacing is frenetic (for a Williams novel…) and the author fills every nook and cranny of the novel with feverish action, enlightening observations on the plot or characters and enough twists and turns to keep fans of the series happy. It’s always bittersweet to see a series come to an end; as fans, we are always eager to find out what happens to our heroes and heroines, but, equally, we don’t want them to ever leave our lives. Perhaps the greatest thing I can say about Shadowheart is that through four long volumes of a story, Williams convinced me to care utterly for his characters and there’s a hole now in my life where they once lived. Few story tellers can do that. Williams does it with alarming regularity. I’m currently reading this series as I greatly enjoyed “Memory, Sorrow and Thorn”. Shadowmarch itself was slow, but eventually picked up just like Dragonbone Chair had done after the first 200 or so pages. However, Shadowplay is such a meandering and relatively boring work that I keep getting distracted by other, shinier things. So its nice to see that the final 2 volumes become a lot more kinetic in pace than the first two.. as I would hate to waste my time reading them only to realize its just not going anyplace. I was unhappy with some of what this reviewer said about the earlier parts of the series, particularly the remarks about the characters being “cardboard cutouts” but ultimately pleased by how the review ended, and do agree with reviewer in that by the end of Shadowheart, the book was like a giant book long “climax” for the author, and it was for the reader as well. I thoroughly enjoyed all of this series and was extremely pleased with the way all of it tied together in the end. I do not think you can have a book that works so well in the end without having some forethought for the plot and construction of the characters early on in the series and the reviewer seemed to imply that hadn’t happened, so in a nutshell, the reviewer can take a flying leap on that part of their analysis, but glad they DID appreciate and laud the series at the end, because it is well deserving of the praise. I have read a LOT of this genre over the years and can say with confidence that this series is top notch. Yes, well, this reviewer stands by his words about the early volume of this series. I very much agree with the reviewer about the cartoonish nature of the first volume and the kind of meandering confusion of the second. In fact Shadowplay left such a bad taste in my mouth (capped off with the paper-thin ripoff of the fall of Constantinople complete with popular misconceptions) that I abandoned the series until this year. The author is absolutely right about Williams creating a situation where you want more stories to be told. I wanted that with the main characters of Memory Sorrow and Thorn, I wanted that with Otherland. I was curious about it in War of the Flowers (whose opening before the “magic” appeared I find riveting). Am about half way through Shadowheart and I can hardly wait to get home to finish it – I am completely hooked. I totally agree with the reviewer’s comments about coming to care for the characters as I find myself thinking about them even when I’m not reading the book.